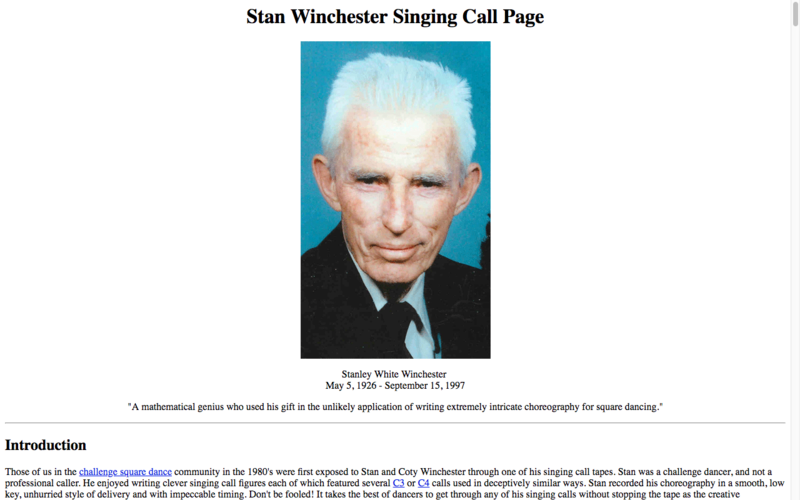 Stan Winchester was a MWSD dancer who created a large body of singing squares for the C4 community. These dancers sometimes share a series of recorded audiotapes with prerecorded calls, and Winchester was appreciated for his ability to fit the complex choreography of challenge dancing into well-phrased singing calls. 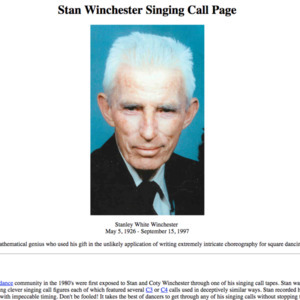 Caller Clark Baker maintains a website celebrating Winchester, and he writes: "While he never called in public, and never considered himself a caller, we hold Stan Winchester in high regard for his very challenging singing squares. My understanding is that he recorded these in his bathroom on cassettes. 99% of MWSD have never heard of Stan but the C4 dancers and callers who knew him and still dance the recordings of his calls love him and miss him dearly." Stan Winchester, “Stan Winchester - C4 Singing Squares,” Square Dance History Project, accessed April 18, 2019, http://squaredancehistory.org/items/show/372.